Throughout 1940 and 1941, radio station 2CA aired a program called 'This Is Canberra' at 10.45 on Sunday nights. Hosted by the director of the Canberra Tourist Bureau, Mr William Dunbar, the program inspired listeners with stories of Canberra's history and beauty. While Dunbar was on a tour of South Australia in June 1940, several notable Canberrans hosted the program during his absence. These guest hosts were Ulrich Ellis (Chairman of the Tourist Bureau), William George Woodger (Canberra's first estate agent), William James Mildenhall (official photographer for the Federal Capital Commission) and long serving Public Servant, Charles Studdy Daley. Daley chose to concentrate in his program on his eyewitness account of the construction of the Molonglo Internment Camp during World War 1. A transcript of Daley's 'This Is Canberra' program and images from the file PC32/19 - Molonglo Internment Camp is ArchivesACT's Find of the Month. The Molonglo Internment Camp was the largest war related construction project in Canberra. Located in current day Fyshwick, the Camp was designed to house up to 3000 "enemy aliens", German nationals detained throughout Asia and interned in China. These 3000 internees never arrived. Ultimately, the camp housed only 200 internees, the majority being family groups who had been living on South Pacific Islands prior to the war. Initially, these families were housed in camps at Bourke and Holsworthy as well as the gaols at Berrima and Trial Bay. The move to the Molonglo Camp was a welcome relief from the harsh climate of Bourke and the overcrowding at Holsworthy. Under the enlightened command of Brigadier General Spencer Brown, the Molonglo Camp was humane environment for the internees. There was a community hall, a library and a school for the children. There were no guards posted near the internee's living quarters. Brigadier General Browne allowed "reasonable parole" for internees to leave the camp for walks and shopping trips to Queanbeyan. When Daley's radio program aired, Australia had recently entered the Second World War. Daley used the camp as an illustration of how, in the face of adversity, public commitment and hard work aided the war effort in the previous World War. In this Session, Mr Dunbar has generally presented to you those aspects of Canberra that are more definitely connected with its foundation, growth, and significance, or descriptive of its natural or acquired beauty. In deputising for him tonight, I propose to tell you something about a Canberra episode that had no essential connection with the building of the National Capital, but, at the time it occurred, represented an important undertaking associated with the Great War of 1914-1918, and was, also, a constructional feat probably without parallel in Australia for the speed and efficiency of its design, organization, and accomplishment. 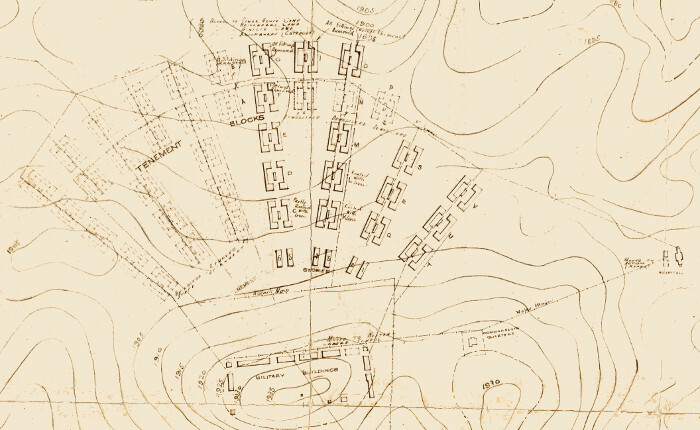 Reference in these days to the Molonglo Settlement reminds us of an area, somewhat to the east of Canberra, in which are found the least favoured of the City's residential provisions and where accommodation is available at the lowest rentals in buildings that have already served their economic life, and are decreed by the Government to be demolished progressively as their present tenants become housed elsewhere. At the time of which I am speaking, however, the name Molonglo Camp connoted an atmosphere of mystery and romantic enterprise, of strenuous endeavour, of willing and successful co-operation, and of wartime sacrifice. As an old Officer of the Commonwealth Public Works Branch, I recollect clearly a certain day, early in the year 1918, upon which a secret cablegram was received from the British Government, asking whether suitable arrangements could be made to accommodate several thousand enemy nationals who were to be removed from the Far East and interned. Although it involved the execution of a scheme which, under ordinary conditions, would have been regarded as almost impossible of fulfilment in the time available, the Director-General of Works, the late Colonel Percy Owen, himself a soldier, was not the man to hesitate over a wartime request because it presented arduous difficulties, and a reply was accordingly sent that Australia would do the job. At that period there was a serious shortage of staff, of skilled labour, and of materials, but those whose services were called upon threw their energies into the work with such goodwill, skill and determination that within nine and a half weeks about 250 acres of vacant land between Canberra and Queanbeyan was converted into a township with provision for 560 families and a large number of single persons, the group houses and other buildings being properly equipped and furnished, and served with water, sewerage and electricity. The incidental buildings and works included large stores for the baggage of the internees, bakers and butchers' shops, fire station, public school, teacher's residence, hospital, and assembly hall, as well as many structures for the housing and general purposes of the military unit, such as look-out tower, guard house, barracks, stables, commandant's residence, and a special railway loop, with station and goods sheds. 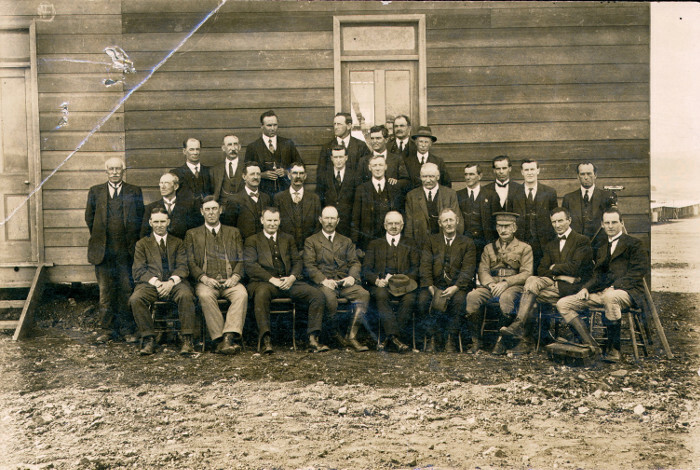 The Molonglo Internment Camp Builders (1918) - Click on the photo for a larger view. Only a few of these gentlemen have been identified: Front Row: 3rd from right: Brigadier General Spencer Brown - 2nd from right: Chief Surveyor Harry Mouat - Far right: Surveyor Layton Knibbs. 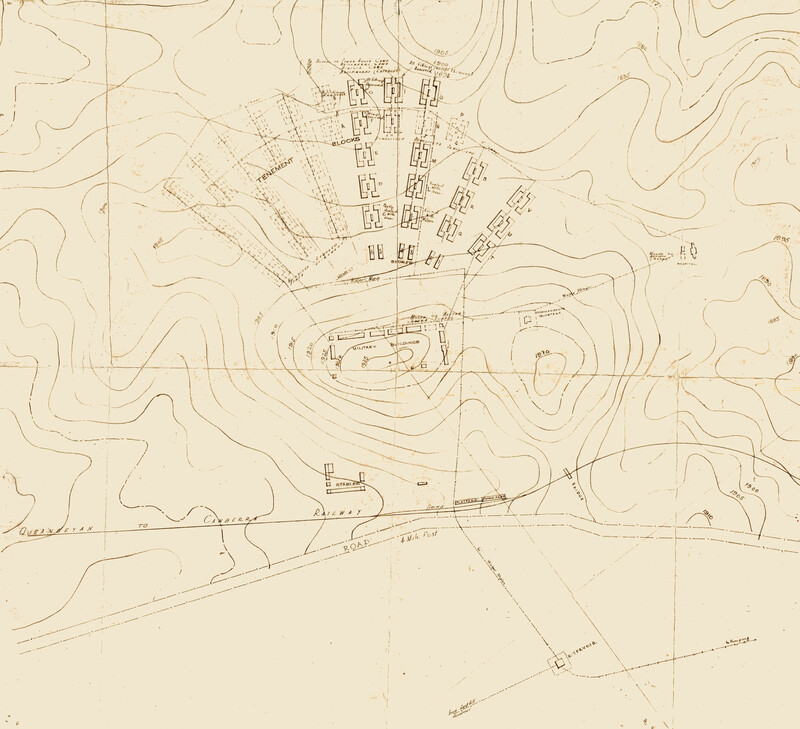 The site selected for the camp comprised a hill about 100 feet above the Molonglo River and sloping land which admitted of placing the look-out tower upon a high position, the military buildings slightly lower, and the tenement buildings in long streets, set out in the form of a fan, for convenience and ease of supervision, with a ring flood lightings around the whole settlement. A map showing the layout of the Molonglo Internment Camp. Click on the map for a larger view. The residences for the internees were contained in 40 tenement blocks of uniform design, each containing two separate parallel buildings returned at each end and thus enclosing a small internal square in which bathrooms, laundries, and conveniences for the block were placed. Each block was 140 feet long and contained fourteen tenements, seven in each separate structure, but the plans were so arranged that considerable flexibility might be afforded, if necessary, to provide for families of varying sizes. These units, and, indeed, the whole building portion of the scheme, were designed by Mr J.S. Murdoch, at that time, Chief Commonwealth Architect, and somewhat later one of the Federal Capital Commissioners. To attain maximum speed in construction, the work of erecting the 40 tenement blocks was divided between four Sydney contractors, - Ellis Bros., Saxton and Binns, George Hudson Pty. Ltd., and the State Timber Yards. The extensive engineering works, and the military and accessory buildings were erected directly by the Department. These included a number of structures that were removed from the A.I.F. Officers' Training School that had been established at the Royal Military College, Duntroon, in 1915. The transfer of these buildings involved the provision of a large transport team, comprising five traction engines, 30 trailers, many horse teams, and even two bullock teams. It was an interesting sight to observe them in action, negotiating the partly formed roads with huge sections of the buildings set up on jinkers. This transport section handled 8,500 tons of material during the nine and a half weeks of concentrated activity. The procedure for the erection of the tenement blocks was for the surveyors first to advance from the apex of the fan-shaped plan and mark on the ground the position of each building in the particular line. They were followed by labourers who dug the holes for the stumps, carpenters who nailed down the floor Joists and then the floors, and finally, by the contractors' men who erected the superstructures for which the frames and walling had been prepared in Sydney. Arriving from Melbourne, one morning, I came upon this hive of industry and it was an inspiring spectacle. I had never before seen men working so hard and so cheerfully. They felt that they were doing their bit. The noise, however, was deafening for there was a veritable army of carpenters all hammering at once. It sounded something like machine-gun fire. In these operations they actually used over ten tons of nails and three million super feet of timber. The length of the timber required for floor stumps alone was over ten miles, and the flooring put down covered an area equal to seven acres. The tenement blocks alone absorbed 3,000,000 super feet of timber, and the aggregate length of the wooden steps to entrance doors was about a mile and a half. A plan of a complete Tenement Block. Click on the plan for a larger view.